Tag line: "The park is open"
Like a good many people, I wasn’t blown away by either of the sequels to 1993’s Jurassic Park. It’s not that I hated The Lost World (1997) or Jurassic Park III (2001); both movies featured a handful of entertaining sequences, and the effects were decent to good. But one thing those two later films failed to recreate was the sense of wonder that made Jurassic Park so damn engaging, taking instead what had been an awe-inspiring story with real moral ramifications and transforming it into a pair of straight-up action films. Released 22 years after the original (and 14 years after the most recent sequel, Jurassic Park III), director Colin Trevorrow’s awesome Jurassic World is a welcome reminder of how exciting, how frightening, and... yes... how amazing dinosaurs can be. It’s been 2 decades since the tragedy that rocked John Hammond’s Jurassic Park, and InGen, the company he founded, has come a long way since then. For years now, thousands of people have been flocking to Jurassic World, a bigger, even better amusement park. With the new owner, Mr. Masrani (Irrfan Khan), picking up where Hammond left off, and Claire Dearing (Bryce Dallas Howard) overseeing the day-to-day operations, Jurassic World wows adults and kids alike with its state-of-the-art attractions and impressive dinosaurs. Claire’s nephews, Zach (Nick Robinson) and Gray (Ty Simpkins), have recently arrived, and are looking forward to their stay at Jurassic World, but despite promising her sister Karen (Judy Greer) that she’d personally look after the two, Claire instead passes Zach and Grey off to her assistant Kara (Katie McGrath), who will act as their chaperone during their stay. Of course, boys being boys, they eventually ditch Zara to explore the park on their own. Part of what’s keeping Claire busy is Jurassic World’s newest upcoming “attraction”, a genetically engineered super-dinosaur known as the Indominus Rex. Larger and meaner than any of the park’s other creatures, the Indominus Rex lives in its own paddock, and to ensure its structurally sound Mr. Masrani invites Owen Grady (Chris Pratt) to inspect the pen. A former Navy man who has been training a team of Velociraptors for the military, Grady isn’t too keen on the idea of a genetically enhanced dinosaur, especially one that has spent its entire life in captivity. 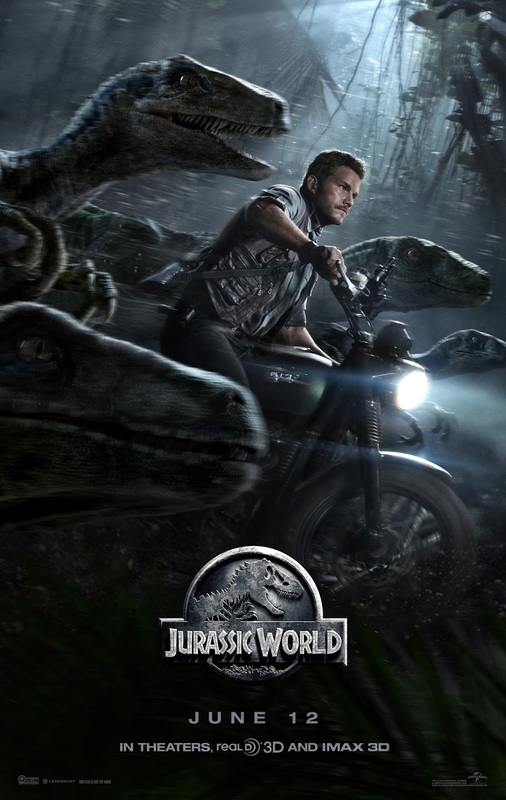 Like its predecessors, Jurassic World is filled to its breaking point with incredible special effects and exciting action sequences, but it also reintroduces that sense of awe and wonder that made the original film such a terrific experience. When Zach and Grey first arrive at the park, the overly-enthusiastic Grey runs ahead of his brother and Zara to admire the holographic displays in the main lobby and, as John Williams’ now-iconic score plays underneath, he rushes through their hotel suite and throws open the back doors, giving him a great view of the entire park (in all its glory). Along with showing us just how high-tech Jurassic World is, this scene allows the audience, for a moment anyway, to feel like a wide-eyed kid, drinking in some truly amazing things. In addition, Jurassic World dedicates a fair portion of its time to the relationship between man and dinosaur; Claire, who spends most of her day in the main control room, had, for years, viewed the dinosaurs as nothing more than company “assets”. That all changes the moment she and Grady, while tracking the Indominus, stumble upon a wounded brontosaurus that had gotten in the humongous creature’s way. Thanks to some well-realized animatronics, this scene is both tender and heartbreaking. Not to worry, though, because if its action you want, Jurassic World certainly has what you’re looking for. In fact, many of the dinosaurs featured in the previous sequels get in on the fun this time around as well (one of the movie’s most intense sequences involves the aviary that was a major part of Jurassic Park III), and there’s a late scene with Grady’s Raptors that you won’t want to miss. As for the effects, Jurassic World is every bit as groundbreaking as the original Jurassic Park (there are plenty of examples I can point to, but my favorite comes when Zach and Grey are enjoying themselves at a Sea-World style exhibit, and we get to see one massive underwater dinosaur). With a box-office tally that exceeded $1.6 billion (it was the first movie in cinematic history to bring in over $500 million worldwide on its opening weekend), Jurassic World has all but guaranteed that we’ll be seeing yet another Jurassic Park sequel somewhere down the road. But thanks to this movie, I’m looking forward to what executive producer Steven Spielberg and his team will come up with next.